This weekend I finally got an opportunity to mount my extruder onto my machine and attept a print. I am using HPDE as my current printing material and photo paper as my bed. I have still been having problems with the accuracy of my Z axis and didn't pay enough attention to the print head during my first few prints. I eventually noticed that the head was being pressed into the printed shape so much (due to a slipping Z axis) that the print head was wiggling its way out of its PTFE holder / thermal barrior, causing irreversible dammage to the holder. I went ahead and ordered two more, in case this happens again, as well as ordering a supply of ABS plastic for extruding. From what I have read, ABS doesn't have the warping / sticking problems that HDPE has, and I should be able to extrude it faster, cutting down on print time. Here is an image of my last print. You will notice that the raft is too thick to be practical. This is a configuration issue that should be easy to fix in the future. I was attempting to print a pully from the Darwin STL Library and got past layer 8 before the Z axis slipped. The next step is for me to get my Z axis more solid so this never happens again. I am seeing that the weakest link of my Z axis is the motor coupling, so that is where I will direct my attention. I started building my extruder in the last few days. I am still waiting on a stepper motor driver board, so there is no hurry to get this working. However, I have made quite some progress. Here is a picture of my heater. Here is picture of my pinch wheel driven by a Nema 23 stepper motor. Overkill? Maybe. I do not enjoy admitting defeat on anything. I find myself checking and rechecking my work until I realize an entire weekend worth of work was wasted by not admitting defeat. 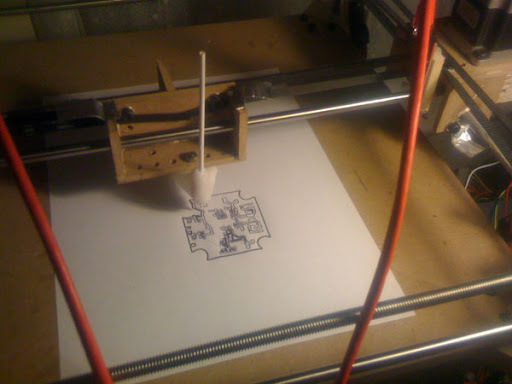 At this time, and after an entire weekend of work, I must admit that milling PCBs with a 1.0 Darwin is not possible. The reason for this is quite obvious, in retrospect. Put simply, the force required to etch copper is enough to twist the X axis guide rails. When the guide rails twist, while moving the toolhead in the -Y direction, the milling bit gets pushed into the milling surface. This results in a really bad situation. If the design requires further milling in this direction the bit eventually pushes clear through the 1.5 mm board and into the table. Here is a picture of one of six goes I had this weekend. 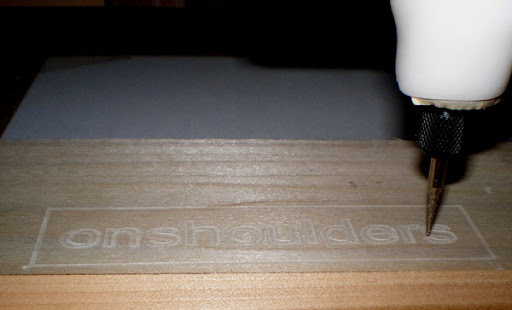 As you can see, when milling just to scratch the surface the resolution was perfect. When attempting to mill through the copper the bit would catch and dig right through. I put a piece of red tape where the bit went through to make it stand out. I still think it may be possible to pull PCB milling off if you are willing to redesign the x-carriage, but I am against drifting this far away from the original Darwin design. For anyone wanting to go as far as redesigning the x-carriage, I envision mounting the milling head between the guide rails. In this way, if the guide rails twist, the bit should retract from the milling surface in both the -Y and +Y directions. A better long term solution would be to use a design closer to a McWire for milling / subtractive manufacturing and the Darwin for additive. At this point I have gone ahead and ordered a stepper motor driver board from Zack's new shop. 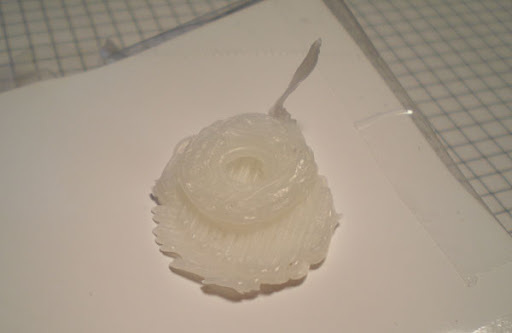 When I regain my motivation I will continue working on my extruder. This has been an image of inspiration to me ever since it first appeared on my monitor. Now that I have mounted my Dremel to the X bracket I decided to try some etching. This G-Code was created by using CamBam. 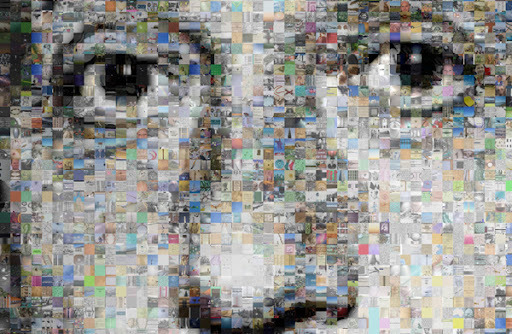 Ok, so let me speak for a moment to the power of open source, the power of standing on other people's work! About three hours ago I was coming down from the high of getting my machine to talk G-Code. 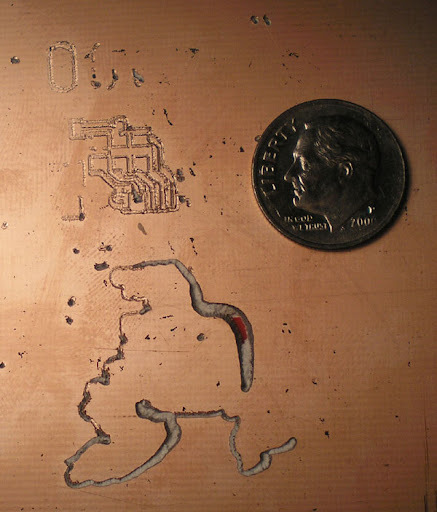 A few minutes ago I just drew the layout of a printed circuit board. Here is a picture of what I am talking about. So basically, in three hours I did the following. Now all that is left for me to do is put a Dremel on the X bracket and I can mill PCBs!! Compare these three hours to the three weeks it would have taken me to write the bare essentials necessary to do this! This is the power of open source! 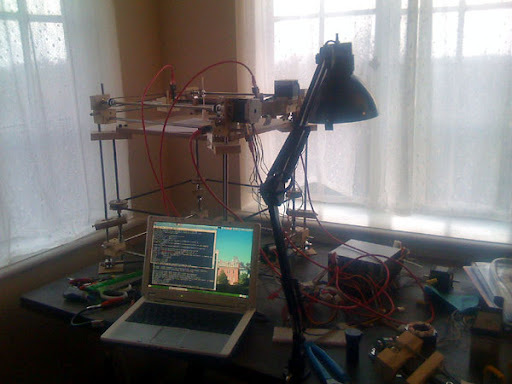 Open source that broke out of the shackles of software and into the world of tangible things. I have been attempting to teach my RepStrap g-code for the past several days as I am waiting for a roll of HDPE to come in the mail. There are several reasons why this has been difficult for me. 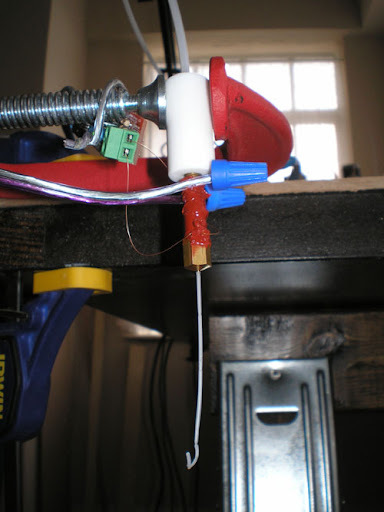 First, I have not been able to use the off the shelf solution that was written by Mike Ellery and extended by others because of my stepper motors. To save a buck I went with some NEMA 23 knockoffs that turned out to be very disappointing. They do not behave like the suggested motors in that you cannot get them to do a full step. They are also a tad lacking on torque. Because of this I have had to take down the speed a bit and rewrite the step functions to delay between half steps. The second issue I faced was getting the driver boards to turn on at all when following the wiring diagrams for Darwin. I finally figured out that the enable pin had to be set to ground, something the diagram does not show. The third issue I experienced when trying to calibrate my machine. For some reason I have yet to understand, the Y axis requires more steps near 0 mm - 30 mm per mm than it does for the rest of the range. To keep the range consistent I had to move the opto switch in order to set the 30 mm position to 0 mm, cutting 30 mm off of my printable area. After solving these problems my g-code firmware works like a charm. Here is a picture of my current setup. 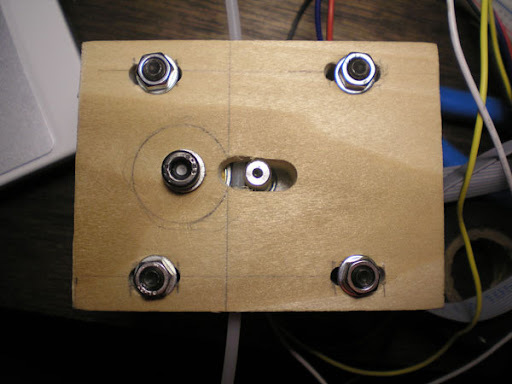 The next thing on the list for me to get working is a Dremel milling tool head for milling PCBs. With my RepStrap talking g-code I should be able to mill the stepper motor driver board for controlling my extruder.